Restoration of flooded hospital could take "months rather than weeks"
The Irish Association for Emergency Medicine – which represents doctors working in emergency departments – says the HSE needs to give the public a clear indication on the timescale for reconstruction. THE RECONSTRUCTION OF Letterkenny General Hospital could take far longer than being predicted by the HSE, the Irish Association for Emergency Medicine has warned. A major clean-up is continuing at the Donegal facility after parts of it were flooded on Friday following heavy rain. The ground floor was said to be “completely destroyed” by the rising waters after the River Swilly overflowed. The Emergency Department remains closed, and patients are currently being diverted to Sligo Regional and to Altnagelvin Hospital in Derry. The latest update from HSE West states that the ED is likely to remain closed for a number of weeks. …it must be appreciated that for an Emergency Department to function and provide a safe service to patients, the necessary supporting infrastructure needs to be in place. Basic hospital functions such as medical records , diagnostic imaging services , laboratory services, inpatient beds, inpatient specialist teams and operating theatre capability are required. Fergal Hickey, a consultant in emergency medicine at Sligo Regional Hospital and spokesperson for the IAEM, told RTÉ’s Morning Ireland it was likely the reconstruction and restoration effort will take “months rather than weeks”. He said that in the meantime hospital staff at Letterkenny – and at Sligo and Altnagelvin - were facing a major challenge, and that it was inevitable “patients will take longer to be seen”. 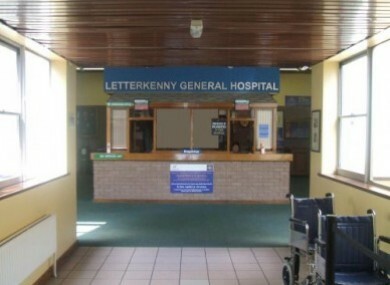 Letterkenny General Hospital remains closed to all visitors today due to risk of contamination, a spokesperson told TheJournal.ie, as many areas of the facility were soiled during the flooding. Email “Restoration of flooded hospital could take "months rather than weeks" ”. Feedback on “Restoration of flooded hospital could take "months rather than weeks" ”.